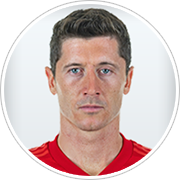 Poland Footballer Robert Lewandowski in 2019. Data profile of Robert Lewandowski who is contracted to Bayern Munich. For primary use with Football Manager 2019.